Just ahead of the weekend, memory maker Micron provided an update with regard to its GDDR5X and GDDR6 development and production. In brief, it said that it is continuing to introduce new and improved GDDR5X chips. These 'G5X' memory chips were launched at 10Gbps and Micron can now supply them in 10, 11, and 12Gbps. Furthermore its development team has tested 16Gbps GDDR5X memory chips. Turning to GDDR6 development, Micron says this dual-channel architecture memory will hit mass production early in 2018. Micron says it is pushing ahead developing graphics memory chips to satisfy strong demand from the GPU / graphics market. Market segments, that are all strong, include; PC gaming, console gaming, professional visualisation, HPC / Data Centre, and autonomous vehicles. You can see from Micron's analysis, above, that all these segments are benefiting from extraordinary growth drivers. The firm fully expects the upwards trend to continue to 2020 and beyond. As mentioned in the intro, Micron is now selling GDDR5X chips rated for 10, 11 and 12Gbps. The production team are focussed upon increasing data rates and yields. The recently launched Nvidia Titan Xp uses "Micron's next-gen G5X at 11.4Gbps, which is now in mass production," we were informed. 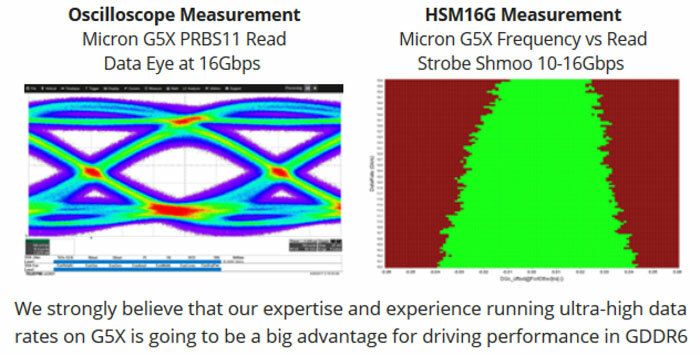 Interestingly Micron engineers have had success in trialling 16Gbps GDDR5X "on a meaningful sampling size of our mass production G5X (Micron speak for GDDR5X) silicon". This bodes well for graphics card updates going forward. The testing of GDDR5X at these ultra-high data rates is going to help take GDDR6 even further up the performance ladder, reckons Micron. As you can see in the table below, comparing GDDR5X and GDDR6, the performance of GDDR6 is modestly estimated to be around 12-14Gbps at launch but this could easily be revised upwards next year. You must also consider the two stated key advantages of GDDR6; the introduction of an FBGA180 ball package with increased pitch, and a dual channel architecture. Because HBM/HBM2 is a lot more expensive to produce. So there will likely be GDDR5, GDDR5x, GDDR6, HBM and HBM2 in co-existence for a while yet. Just like USB2, USB3, USB3.1, TypeA, TypeB, Mini and Micro Type B and now Type C. There are Still some USB1 products out there where bandwidth doesn't justify the extra expense for USB2, and that cost difference is just pennies.